I don’t know how you would define the word homestead. When I was growing up, the term always conjured up scenes from “Little House on the Prairie.” A farmhouse, a barn, chickens, cows, horses, and crops in the field. Our current homestead doesn’t look much like the one that was portrayed in the television show. We actually live in less than a quarter of an acre in a small town. 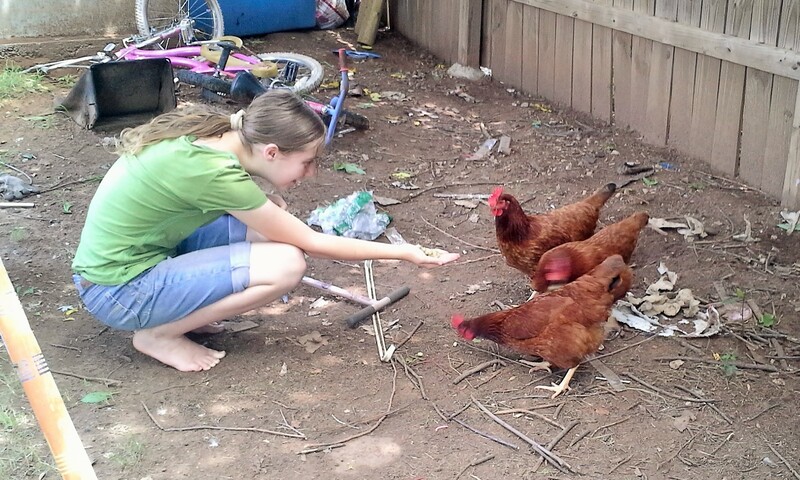 Our backyard is just big enough for our chickens, our garden, and the trampoline. We don’t have an old-fashioned farmhouse (although I would love one), just a typical “ranch-style” house. The only animals that we have are chickens and cats. We don’t manage to grow much in our garden (although I have lofty goals every year). We hope one day to move out into the country. We would like to have enough land that our children can raise any animals that they want–and are willing to take care of. I would like the kids to have lots room to build things and work on projects that they want to do. I would love to have room for more books. I would like to have more room to have people over. We would love to be able to have a bonfire without neighbors calling the fire department. But for now our home is in town. Our yard is small. Our house is fairly small. This is what God has given us for the time being, so this is where we will serve Him for now. We will take care of the animals that we have. We will work on projects that we have room for. We will be thankful for e-books and the library. We will practice hospitality by inviting one family at a time. We will enjoy the bonfires that we are invited to and just make our own s’mores in the microwave. I’ve adjusted my idea of a “homestead.” A homestead is more about the intent to build something worthwhile than it is about the animals raised or crops produced. Our homestead is where we make our home, where we raise our children, where we fellowship with friends and family, where we serve the Lord in our daily lives. Some day our homestead may be bigger, or it may be smaller, the location may change, and eventually as the kids grow up the number of residents will change, too; but I pray that our intent to build something of eternal value in the lives of our children will not change wherever God places us.